In addition to the Wyndham Hotel Savings Program, Kentucky Farm Bureau members can take advantage of TripBeat vacation rental discounts. TripBeat makes it easy, convenient and affordable to search and book resort vacations by providing access to more than 2,400 resort condo rental properties in desirable destinations in approximately 90 countries**. They offer variety, space and value. Farm Bureau members also save 25%** on Preferred Weekly and Short Stays. At TripBeat.com, it’s as easy and convenient to search for, view availability, and book resort condo rentals as booking typical hotel accommodations online. 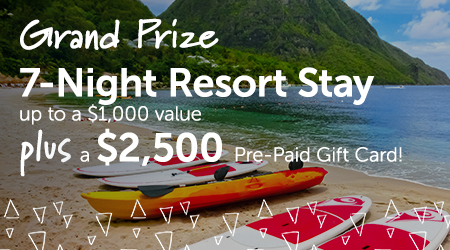 Grand Prize - TripBeat Voucher redeemable for a 7-Night Resort Stay valued at up to $1,000 and a $2,500 Pre-Paid Gift Card!